Justin Robinson is a jazz saxophonist and flutist. Robinson established himself as a child prodigy when, while still a teenager, he began running after-hours jam sessions at the renowned Blue Note Jazz Club in New York City the late 1980’s. He released his debut album “Justin Time” in 1991, which featured saxophone legends such as Bobby Watson and Gary Bartz. Robinson has shared the stage with greats like Diana Ross, Abbey Lincoln, the Dizzy Gillespie All-Star Big Band, and currently tours with trumpeter Roy Hargrove. 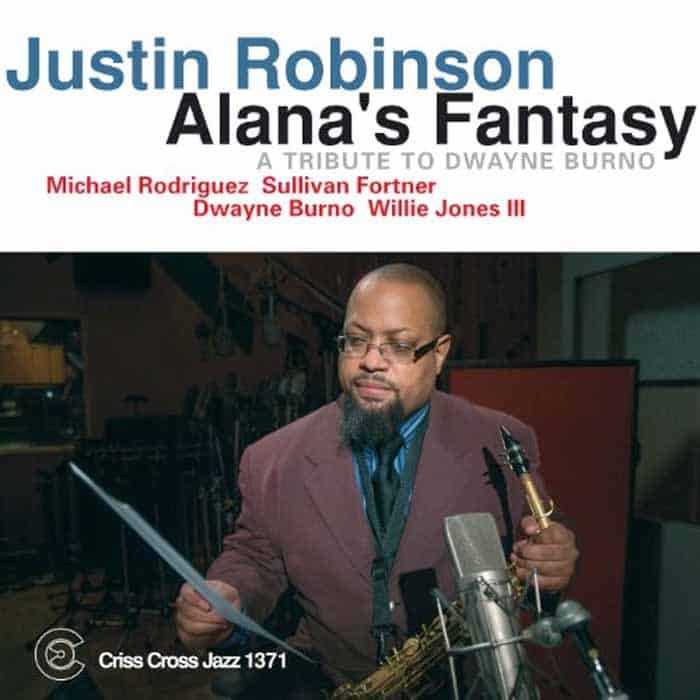 His newest album, Alana’s Fantasy, comes out today under the Criss Cross Jazz label. Justin Robinson: I am fortunate to have had the chance to record for a label that has allowed me a lot of freedom. As long as no one is wasting time in the studio, the label pretty much gives you complete license. Basically, I just want to tell my story and hope in the process of doing it that I create work that people can enjoy. We tried to choose songs that I’m close to and also some tunes I’d been working on like Thelonious Monk’s song “Eronel,” which is actually deceptively harder to play than most people think. Like a lot of Thelonious Monk’s music, you listen to it and say, “Oh, this is a great tune, I should play it!” But then you start practicing it and working on the phrases and you realize his compositions are really hard. NA: Have any new technologies influenced the way you perform? JR: Not really. However, technology has allowed me to have my entire [musical] library with me at all times, which is really invaluable. So now, if I’m in the mood to listen to Charlie Parker and then Billie Holiday, Dinah Washington, or Sonny Rollins, I have everything at my fingertips. Having those things on your iTunes or on Youtube provides so much motivation, there’s always something to listen to. NA: What do you make of the up-and-coming musicians in the industry? JR: I know some of the young guys who are out doing their thing. There are guys like Sullivan Fortner and Jonathan Batiste, who I think are very special musicians, but it’s like any other industry – you can find all spectrums of the rainbow. So you’ll find the great musicians and then there are always going to be guys who you listen to who and you say, “This is not my cup of tea.” But that can be said about any genre of music in any era. NA: How has jazz changed since you came on the scene? JR: There are fewer jazz clubs, for one. And the addition of jazz programs in so many Universities is another change. These are big differences from my era. My generation learned, basically, the way a boxer learns boxing … from the masters, but also from taking some beatings. Clifford Jordan used to come down to my jam sessions at the Blue Note and challenge me all the time and George Coleman walked in on my first and only gig at Bradley’s. I don’t think those kinds of experiences happen as much now. I do think some of the younger generation has been taught a little differently, conceptually, from the way I learned how to play. We took private lessons with guys like Frank Wess and now some of the Universities have these masters as adjunct professors. From that perspective, it’s great that younger players have such access to great musicians. NA: Is it harder for new artists today to become great with so few opportunities for those types of experiences? JR: Yeah. I think one of the lessons I really appreciated from the early 90’s era was that you were actually playing in front of people. There’s a big difference from being in the practice room and honing your craft just through study, and actually applying it in real time. It’s just like if you’re an athlete. Nothing can replace the intensity of an actual game. You know, you can train as much as you want, but until you actually get into the ring, you don’t really know where you stand. And I think that that’s always the best way to work on your deficits. It’s important to be in uncomfortable situations sometimes. NA: You were close friends with the late Dwayne Burno, who plays bass on this album. How did Dwayne influence you as a musician and as a person? JR: I was a little older than Burno, but his work ethic, passion, and love for music was something that always inspired me. He was the type of guy who would even memorize stuff from liner notes on record albums. When I think about a pure musician, he’s one of the guys out of my generation that first comes to mind. He played with some of the most important musicians of the twentieth and twenty-first century, there’s no question about it. I feel blessed to have played with him and, more importantly, to have known him as a person. He was probably one of the most genuine individuals that I’d ever crossed paths with. And I loved him for that.